Here you'll find car related software applications that'll perform various functions. Like OBD diagnostic software, car repair manuals, auto management/maintenance, etc. Software is available as download for instant access — or you can have it delivered physically to your door. 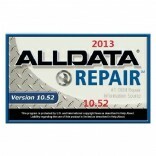 AllData contains detailed information for maintenance, wiring and repair work for all brands of cars..